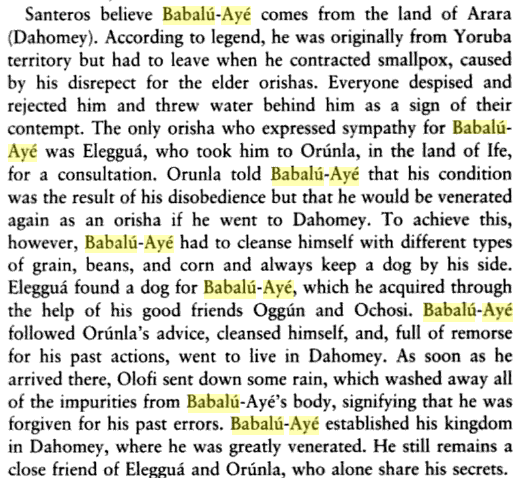 Babalu Aye, translated father of the world, is the Orisha in the Yoruba/Lucumi tradition as the Orisha that oversees diseases, illnesses and healing. If you’re an “I love Lucy” fan you may have heard of “Babalu” in Ricky Ricardo’s (played by Desi Arnaz) song on the show. His way of paying homage to the Orisha and the original Cuban composer of the song. 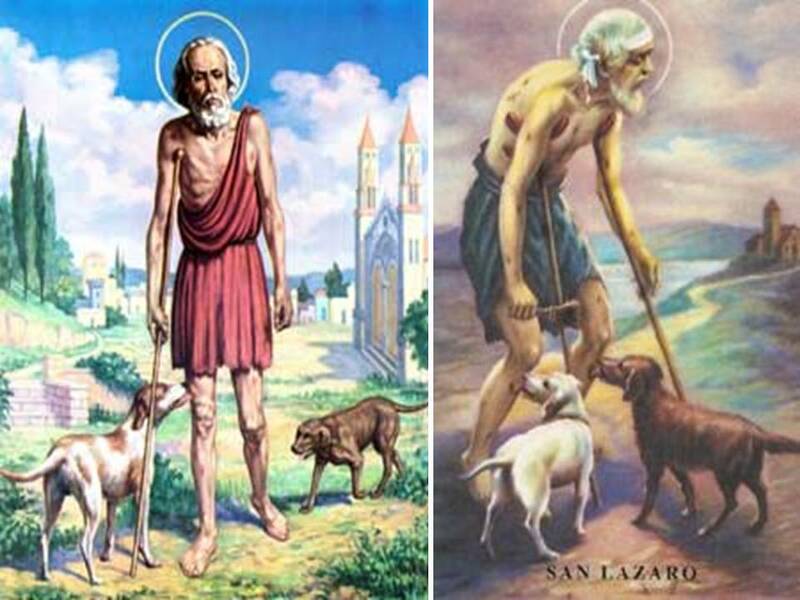 In the bible, Saint Lazarus is known as the man Jesus raised from the dead or the rich man vs. Lazarus parable depicted in the bible. He goes by many names depending on the region he is honored around the world. In Nigeria he is known as Obaluaye, in other parts as Omolu, Sonponno &amp; San Lazaro (Saint Lazarus) in his syncretized version throughout Latin America. He is personified in many aspects most notably his hunch back form and his use of crutches, as well as skin ailments such as sores and leprosy. He is also accompanied by 1 or 2 dogs, as we may know dogs are very intuitive and are able to smell diseases from distances. Babalu Aye has a major impact on his devotees in the sense that many people provide all kinds of offerings to him. These offering are not limited to things and foods, but also self sacrifice physically during pilgrimages. In Cuba, some make the journey for many miles on their knees, while others add blocks and chains to their ankles making the journey a lot more difficult. This is to show their adoration, gratitude or repentance to him in return for his blessings &amp; answering prayers by curing/saving them of illnesses and granting miracles. Traditionally Babalu Aye is depicted as wearing sack cloth which is to symbolize discomfort and pain to the person wearing it, which irritates the skin. It is also a symbol for repentance and suffering to the wearer. This sack cloth is also known as a cilice. Followers of Babalu Aye affirm many feats of miracles and lessons through suffering. He also reminds us to be giving to those less fortunate and reminds us the value to health over material gains. He releases pain and suffering for those battling diseases, especially terminal diseases and ensures a smooth transition into death. He also teaches lessons to those who may have little regard for their health as the body is your sacred temple and at times we do not realize what we have until its too late. If you or anyone you know is suffering with any health issues you can call upon Babalu Aye for assistance. Below I will show you a few basic and optional items you can offer Babalu to help you get through any health difficulties. 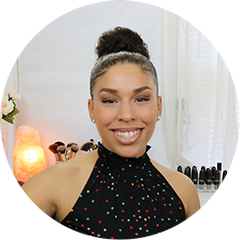 This is also ideal for healers or care takers to further enhance their powers and gain favor of this deity when working with others through their healing process. All offerings are preferably placed on sack cloth or burlap you can purchase at most craft stores or visit your local market where most vegetables like sweet potatoes, etc are transported in sack cloth. Traditionally, offerings of grains for Babalu Aye are placed in a Jicara (dried Guira/Calabash fruit that has been halved) as a vessel for his offerings of grains. This can also be used to hold water as an offering to any Orisha. If you’re unable to locate, a wooden bowl will also do. His principal offerings are dried grains &amp; roasted corn. Primarily black eyed peas or black beans, although any color or type of grain can be provided. A purple onion is placed on the middle of the grains. The grains represents the human body, nourishment while the onion is known to repel and extract odors and illness related energies from the environment. Rum, red wine, coconut syrup or (Coquito) are some of the liquid offerings that can be provided to Babalu Aye. In addition to coffee and water and even soda pop is what I personally offer to my altar. The mentioned herbs can be used as an aura bath or as a floor wash for the room or home of the sick person this offering is dedicated to. Bay Leaves; Broom Camphor; Clove; Carnation; Ginger; Heliotrope; Pine Nuts; Poppy Seed; Rosemary; Rue; Sag;e Sesame Seeds; Thistle are the herbs related to this Orisha. Colored candles are Bablu Aye’s favorite, especially the multi color or 7 powers/ Chakra candles. Purple, Brown and even black candles can be used. An all white candle is also useful if you’re unable to locate any colored candles. Other miscellaneous offerings: For a more elaborate offering you can add the below as optional to the more basic items mentioned beforehand. Before the ritual begins one must first acknowledge the road opener, Legba who is his confidant and opener of the ways. Through Legba we are able to have our prayers and offerings sent to the orisha. You can set a plate aside with a little of everything (especially the grains) to legba to acknowledge and appease his role as the messenger. Once the altar to Babalu and offering to Legba is completed, you will begin with a prayer. I typically don’t have a specific prayer I read from. I simply provide my name and thank Babalu for all that I have, including health and ask him to grant me health to conquer and defeat obstacles. But, you can recite any prayer dedicated to all those suffering with illnesses. The Allan Kardec prayer book has a prayer dedicated to the sick &amp; suffering that I reference every now and then. Once I have commenced with my prayer of gratitude I take a few moments of silence to calm my mind and energy field. I then sit in front of the altar and explain my situation at hand or simply give thanks for continued health for my being and family members. I sit and speak to him as if her were a friend. I’m sincere with anything I may need clarity with and ask for wisdom to make the best choices for my overall well being. It is not necessary to ask for anything as its best to have faith in your day to day doings. However, if there is an immediate need for healing of your self or someone you love, have faith and confidence that Babalu is at all ears to listen to your request and grant you healing in the matters at hand. If you promise anything make sure you keep your promise. I typically don’t promise anything more that what I’m able to give or has been given at the altar. I leave the altar up for 7 days and daily take some grains from the vessel of grains and cleanse my energy field daily for the 7 days. After the 7 days (Preferably from a Thursday to Thursday) although any day will do, you want to pick up all offerings and place them in a bag and discard at a local hospital or clinic. It is said Babalu Aye is typically at the doors of hospitals and near garbage cans. This will signify the closing of the offering and leave behind all remnants of the illness’s energy behind. If doing this for someone other than yourself who is ill, try to get the person you intend to do this ritual for blessings or permission. Sometimes we or others are dealt with certain cards in life as lessons we must accomplish which is between the person and their divine creator. You don’t want to intervene in life lessons. Otherwise, this can be a very soothing and caring gesture for the person experiencing the illness.